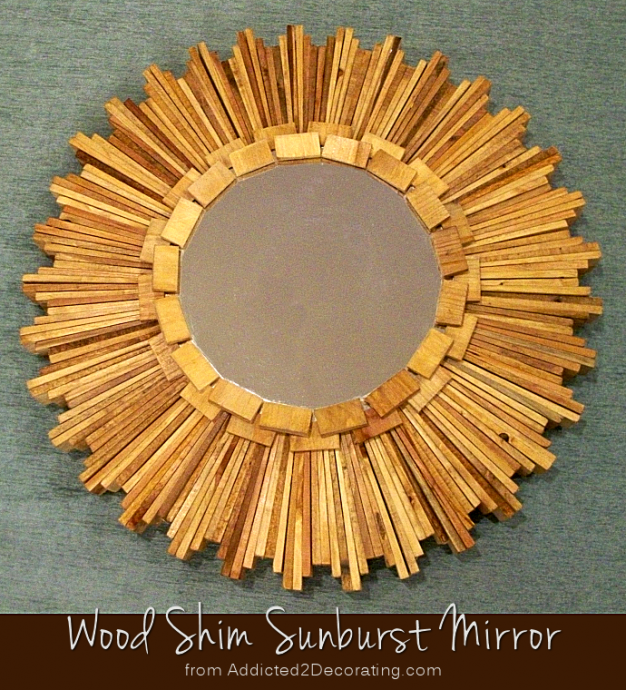 The wood shim sunburst mirror is finished!! And I’m so excited about how it turned out! Because I changed the design, I didn’t have nearly enough shims to make the complete circle. So, I made another trip to Home Depot to pick up more packages of shims so that I could complete the circle. 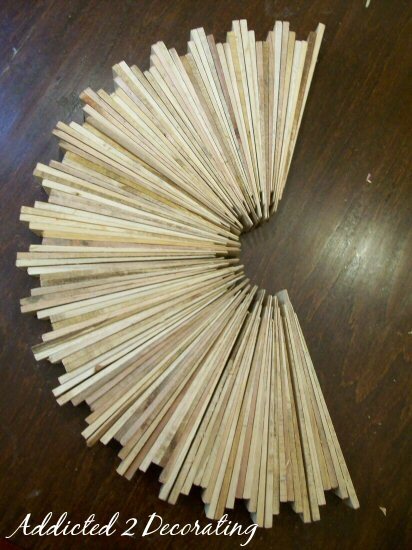 In all, I used 17 packages of shims, and the complete circle required 33 sections of 6 shims each. When the wood glue was fully dry, I turned the sunburst over, and adhered a round mirror in the middle, and then used my glue gun to attach 1″ pieces of shim (that I cut with my miter saw) around the edge of the mirror. 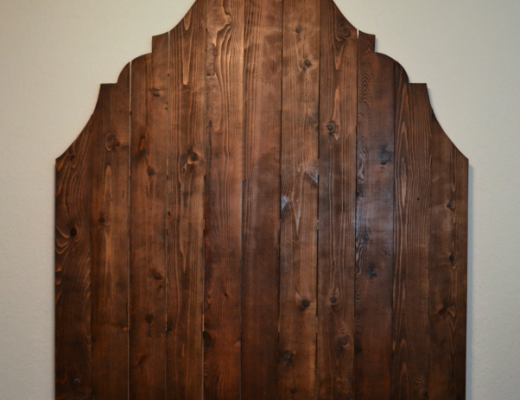 And then I added a second row of 1″ pieces to cover the edge of the mirror. And with that, the construction was finished! I didn’t want to stain the wood, but I did want to seal it. I only had non-yellowing polyurethane, but I actually did want the finish to add a warmth to the wood, so I opted to use Waterlox that I had left over from my kitchen butcherblock countertops. You can see how the portion on the left has a warm look to it. And after two coats of Waterlox, it was finished! Here’s the final result. Now really…doesn’t that look like something you’d see in a designer catalog?! I don’t think anyone would ever assume that it’s cheap wood shims!! If you decide to try this project, here’s my advice: Don’t weed through the shims and pick out the “ugly” ones. Use all of them!! I had some that were VERY rough looking, but it’s all of the variation that gives this piece such a unique look. I even had a couple of pieces that still had bark on them! I used ’em all. Edit: I’ve had several people ask how heavy this mirror is. I don’t have a way to weigh it, but it feels very comparable to my eight pound weight. I should also mention that the finished diameter is about 22 inches. Pssstt…Did you miss Part 1 of this DIY? If so, click here! You are a GENIUS!! This looks so awesome! That is really cool! Do you think painting it would be good too? I am thinking about trying this out as a statement pc of a sad wall that needs something, but I would want it painted to pop off the wall. Liz, you could certainly paint it! I'd do that before adding the mirror, and then paint the 1" trim pieces separately before attaching them. Be sure that you paint BOTH sides of the 1" trim pieces that will go on top of the mirror, because you will be able to see some of the reflection in the mirror. I'm in awe of your busy-bee ways! I get tired just reading your fabulous blog… This looks great. Well done! Beautiful! I think it would look pretty white too…it looks very heavy.. I love this. My question is how heavy it ended up being? If I had to guess, I'd say it's between two and three pounds. Okay, I was a little off in my guess. I think it weighs more like eight pounds. I don't have a way to weigh it, but I picked up a five pound weight to compare, and it's definitely heavier than five pounds, but it feels pretty comparable to my eight pound weight. Two to three pounds…lol. I'm sooo not good at estimating weight!! Very pretty! But…how heavy is it? I love this! I would love to try one painted. I would never have thought to use wood shims! What a great statement piece, I don't think I would have ever thought of something this creative! I am inspired. I absolutely love it!! I soooo want to make one for myself! About how much did all the materials cost? Tiffany, all of the materials totaled about $30. That turned out great! I especially love the detailing around the mirror and the variation in color of wood. wow, that is the best DIY startburst mirror I have seen! I am very impressed! 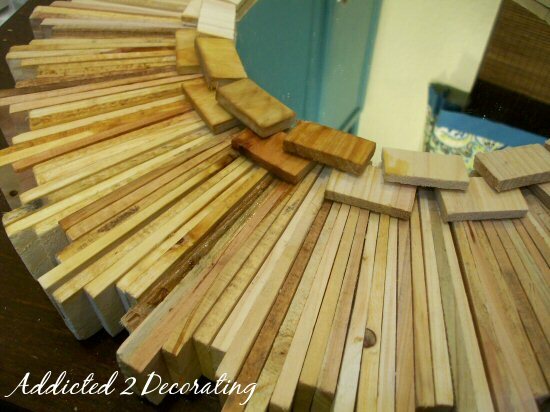 This looks great…you would never know you used shims to make it. Very creative! This is so unique! I love it! Where do you get your inspiration…and your talent? I love looking at all your projects! Do you ever rest? This is fantastic!! You continuously blow me away with your ideas!! oh my goodness…..I might seriously have to try this this weekend!! I LOVE this! I have been looking for a round mirror to go in my bedroom over our dresser. Your pictures make this project seem very simple but I wopuld need to stain mine to a darker color…closer to cherrywood. I am going to have to consider this carefully before jumping out there. oh my god, that is freaking amazing! i LOVE it! Wow! How creative! I love this idea! Thanks for sharing. This is impressive. How much hands on time did it require? NO…WAY!!! what a great idea! bookmarking in my head on this!! WOW..that is a super fabulous idea and it came out awesome!! This is def going into the "to make" file. Great Job!!!!! I love it! That looks AWESOME POSSUM! So cool — so cool that I am going to profile it on my blog this weekend I think!! What a wonderful project! well done..
ok now THAT is cool!! I am so impressed with this mirror! I would never have guessed it was shims. Just came across your blog and I'm a new follower. I am not joking when I say this could be in my top 10 favorite projects of all time. This is absolutely brilliant. Genius! I hope you don't mind that I link it on my FB page. Love it and will definitely be "borrowing" the idea! Amazing! Came over from Just a Girl…I am so impressed with this project. It's the best sunburst mirror DIY I have seen online!!!!! That is so cool! Very clever! The mirror is beautiful!! I love it! This is AMAZING!!! I'm in love! I can not believe you made that. It looks incredible to say the least. This is genius! 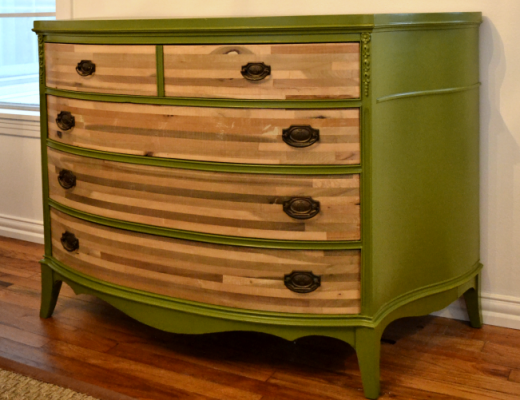 I love it, and after seeing so many pretty starburst mirrors in Ballard's catalog, I'm ready to do a knock-off. I already have a couple packages of shims (cannot remember for the life of me WHY I bought them! ), so I'm ahead of the game already. I'd love to add a convex mirror to the center (like what I saw in Ballard's). Love the warmth of this piece you did. Perfection! Wow! This is the coolest sunburst mirror I have seen yet! Great job! Unbelievable. I am so going to try this. I'm going to follow you so I don't forget to try this. Great job!!! This is fabulous! 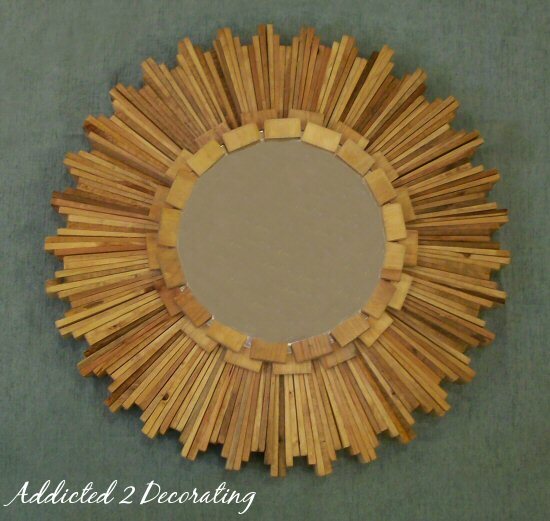 A nice, sturdier take on the sunburst mirrors made with the sticks or coffee stirrers. This would be great on a deck or patio too! If you wanted it to be less heavy, you could cut out the interior ends of the shims. 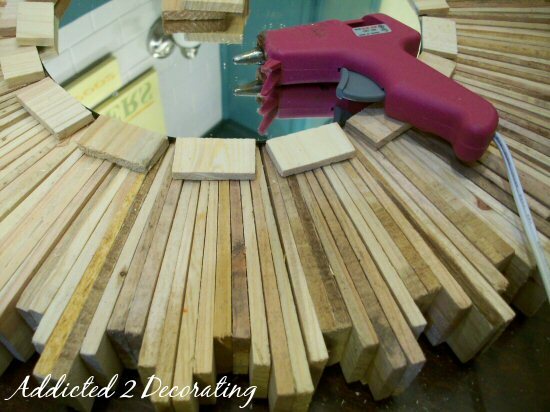 Cut a circle with a diameter 1/2" – 1" smaller than the mirror, before you glue it on. And maybe you could do something with what is left over? LOVE THIS!!! Will you share it at my linky party this weekend?! This is definitely the sunburst mirror I'll be making. Love it!!!! Would you mind updating your blog with a picture of it up on the wall when you find the perfect place? This is truly a work of art you have created. It is perfect. I always see these mirrors in catalogs and was thinking of a way to create them…you did, and quite impressively!!!! I have a feeling Home Despot's all over the country are going to sell out of shims. It's the best looking sunburst mirror that I've seen. Looks so expensive! I want one!! 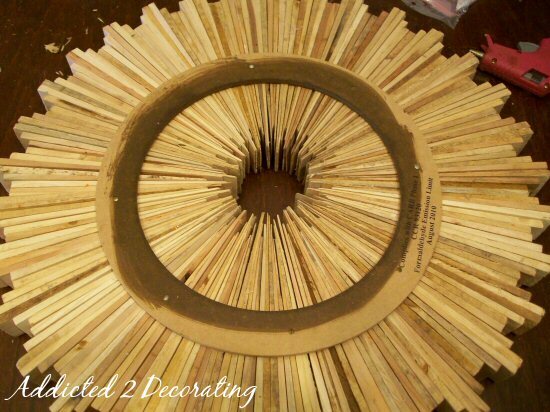 This is definitely the BEST DIY sunburst mirror I've seen! Great job! girl I love this mirror!! !What a clever idea and perfect execution! I love it! I am so excited too because I just got like 6 packages of shims and the D.I. for $1!! How sweet is that? I will be starting this today!! What a great idea. It looks amazing. I'm your newest follower. I'm having a party over at http://diyhshp.blogspot.com/ I would love if you stopped by and linked up your project. Love this idea!! My favorite sunburst DIY that I have seen. Love your blog! You can see em here.. I love it!!! I just saw a sunburst mirror similar to that in a traditional home mag and put it on my DIY list, and have been pondering how to make it work myself.. It is the first sunburst mirror that I have really liked. Thanks for sharing. One Word: Ingenious! Watch out West Elm, you have a competitor! I featured you as one of my favorite's from TT&J's Linky Party. I would love for you to check it out! Love this!! 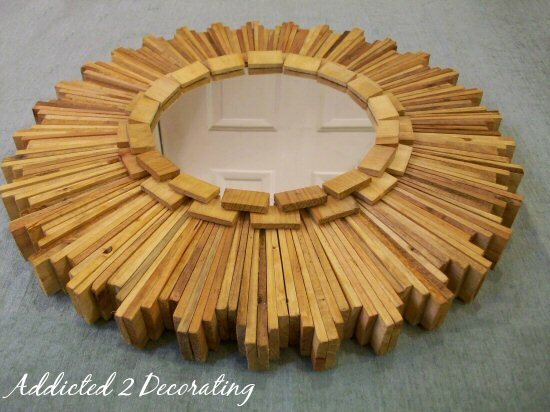 I'm going to give this a try, it would look great in my breezeway! I started working on mine today. What are you going to use to hang it? jandj, I actually hadn't thought that far ahead!! I don't know how I'll hang it, but it's going above my bed, so it needs to be VERY secure. I'd hate to be awakened during the night with that crashing on my head!! I just found your blog on jandjhome. Your sunburst turned out incredible. Thanks for the great tutorial. Funny! My husband and I were just talking about copy catting Ballard Design's mirror and then I saw your tutorial!! I love it. One question…how heavy does it end up being. Just wondering : ) Thanks for the wonderful idea! Wow! This is incredible! Thanks for sharing! 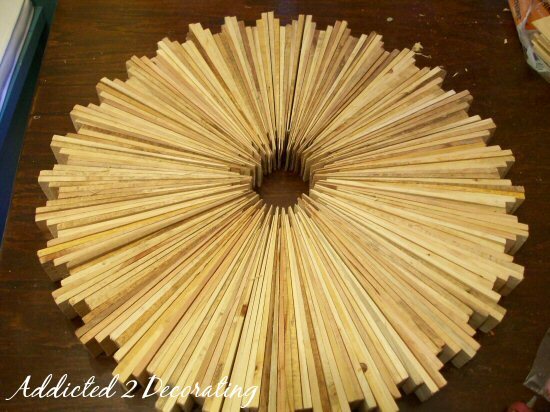 Alicia, I glued the shims together with hot glue, but glued the wood wreath form to the back with a good amount of wood glue. I guess I used the 6-inch shims, because they certainly aren't 16-inch. I just made mine and LOVE it! Can I ask how you're hanging it? Mine is quite heavy and I'm worried it will fall LOL. It's going over the guest bed. $30! Wow such a great idea. I wonder if it will get too heavy if I tried to make it larger.. Has anyone tried? Yahoo!!! I LOVE blog-land…what did I ever do before I could learn from others people's experiences who have "crazy" notions like myself. The plus side for me is bloggers are much more creative and actually make some of my ideas possible. I've been lusting after the Ballard Design 48in sunburst mirror and now can DIY for 1/10th of the cost, which means I can actually afford it thanks to you!!! I'm giddy can you tell? Just saw this and now I know exactly what I am going to do for my starburst mirror!! 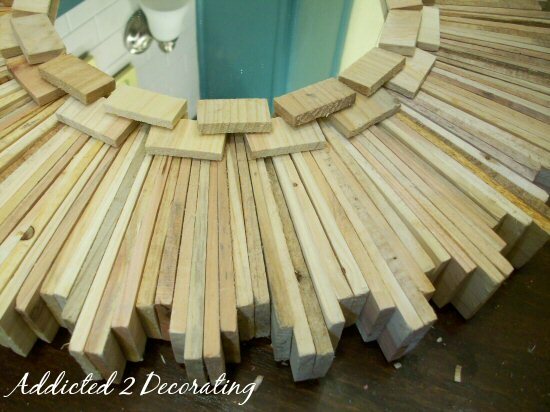 I had bought shims and started staining them already because I wanted to create a starburst mirror with them, but I wanted the mirror to have some depth and personality to it, so I was going to do what you where going to do at first and layer the shims. But not now! Now I am going to recreate your second look. It's amazing. Thanks so much for sharing it. Can you buy the shims already cut to the sizes you need or do you have to have woodworking equipment? I would love to try and make one of these. They are beautiful and much more affordable than buying one already made. WOW! I have the urge to stay up late and try this tonight! I love this mirror. 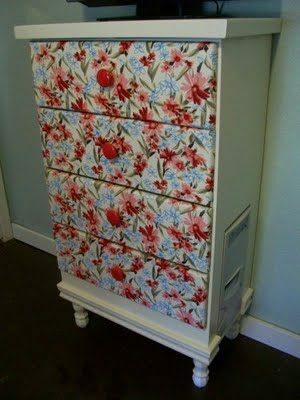 I definitely want to make one myself – such an inspiring idea! Love your blog! Have you hung this yet, though? I am interested in how it should be hung and whether or not it stays together well with hot glue after it is hung and gravity takes hold. I haven't hung it yet, but I can assure you that if you follow the instructions, it's incredibly sturdy. I wouldn't trust the hot glue alone, but the floral ring glued to the back with wood glue makes it super strong and sturdy. WOW looks great! I Want to do this. Love this project so much I made one of my own! Now, I am just trying to figure out the safest way to hang it. I want to hang it over my bed but I am too scared! Did you hang yours yet? If so, please share how you did it. I still haven't hung mine, but I think I would use one of the really small Hangman hangers that they have at Lowe's. There's no way it would fall off of the wall with one of those. Just came across this project idea & LOVE it! I've been looking for the perfect "something" to finish our dining room update, and this mirror is it. I saw that you used about 17 packs of shims…were they 8" or 12"? Contractor pack (42 ct) or regular homeowner packs? So excited to make this….and I don't need my husband AT ALL, LOL! Hello! You did a fantastic job on the sunburst! How long were the shims that you used? You are an inspiration! I have to watch my budget now and you are providing some wonderful ideas that can be used for re-decorating and updating my home. I look forward to seeing all of your projects… Also, great "how-to" instructions! I love this. Way more complex than I'm willing to sit through. I recently featured in a post http://decoratingcents.blogspot.com/2011/11/trends-sunburst-mirrors.html. Would love for you to stop by and grab a button. 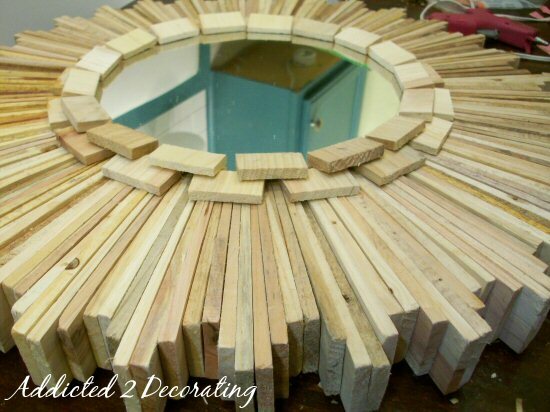 When I first saw the mirror I fell in love with it and expected to be intimidated by the diy process. But, you’ve inspired me to want to try it. It looks great and I can’t believe it only cost you $30 to create. You could probably sell it for A LOT more!. i am in the process of making this mirror and it’s coming out REALLY nice!!! (will post pics when i’m done) i would have been done if i hadn’t kept running out of glue or shims….lol. i have a couple of questions. Did you use wood glue to adhere the mirror? What size was the wreath form you glued to the back? and, what did you use to actually hang the mirror? Thanks for all the inspiration!!! I absolutely LOVE your website!!! This is so awesome!! From reading comments I see that you attached pieces witha glue gun. Just curious if it has held up. What is diameter of mirror and how did you end up hanging it? Thanks so much!!. Yep, it’s held up perfectly. The diameter is about 18 inches, and I hung it with a small French cleat hanger from Home Depot.